After an automatic Workstation update you may also need to update the Projetex Server. Even if both are installed on the same PC, the Projetex Server and Projetex Workstation are two separate applications, and an older version or build of the Projetex Server may not be compatible with your recently installed build of the Projetex Workstation. Most users never or very rarely run the Server Administrator, so no automatic updates are conducted on the Projetex Server. Please be sure to always run the update check on both the Projetex Server and the Projetex Workstation. 1. Download the Projetex setup file (only the latest builds are available for download). 2. 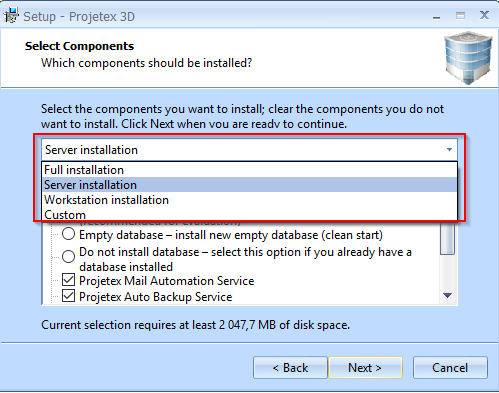 Run the Projetex setup file in "Server Installation" mode, and install the application into the same folder as your current Projetex Server. 3. Your database will remain intact no matter which option you select during setup, however it is recommended to select the "do not install database" option.